I'm looking for an algorithm that compares two RGB colors and generates a value of their similarity (where similarity means "similar with respect to average human perception"). Since I cannot answer anymore I decided to put my "solution" as an edit to the question. I decided to go with a (very) small subset of true-color in my app, so that I can handle comparison of colors by my own. I work with about 30 colors and use hard-coded distances between them. Since it was an iPhone app I worked with objective-C and the implementation is more or less a matrix representing the table below, which shows the distances between the colors. RGB distance in the euclidean space is not very "similar to avarage human perception"
You can also use the CIE color space for this purpose. 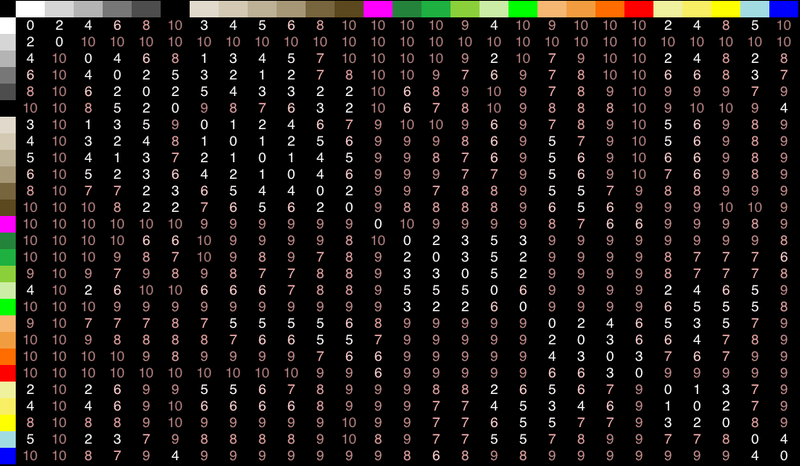 I shall mention that YUV color space is an inexpensive approximation that can be computed via simple formulas. But it is not perceptually uniform. Perceptually uniform means that a change of the same amount in a color value should produce a change of about the same visual importance. If you need a more precise and rigourous metric you must definitely consider CIELAB color space or an another perceptually uniform space (even if there are no simple formulas for conversion). I would recommend using CIE94 (DeltaE-1994), it's said to be a decent representation of the human color perception. I've used it quite a bit in my computer-vision related applications, and I am rather happy with the result. Human perception is weaker in chroma than intensity. For example, in commercial video, the YCbCr/YPbPr color spaces (also called Y'UV) reduces the resolution of the chroma info but preserves the luma (Y). In digital video compression such as 4:2:0 and 4:2:2 reduces the chroma bitrate due to relatively weaker perception. I believe that you can calculate a distance function giving higher priority over luma (Y) and less priority over chroma. Also, under low intensity, human vision is practically black-and-white. Therefore, the priority function is non-linear in that for low luma (Y) you put less and less weight on chroma. In case that resource disappears the author's conclusion is that the best low-cost approximation to the distance between two RGB colours can be achieved using this formula (in code). Color perception is not Euclidean. Any distance formula will be both good enough and terrible at the same time. Any measure based on Euclidean distance (RGB, HSV, Luv, Lab, ...) will be good enough for similar colors, showing aqua being close to teal. But for non-close values it gets to be arbitrary. For instance, is red closer to green or to blue? The XYZ and RGB systems are far from exhibiting perceptual uniformity. Finding a transformation of XYZ into a reasonably perceptually-uniform space consumed a decade or more at the CIE and in the end no single system could be agreed. Color similarity in the RGB cube is measured by the euclidean distance (use pythagoras formula). EDIT: On a second thought, this should be true for most other color spaces too. Not the answer you're looking for? Browse other questions tagged algorithm colors comparison rgb or ask your own question. Most “stable” color representation : RGB? HSV? CIELAB? AS3 Check colour code similar? Methods for quantifying the similarity between two colours?